Spetec PUR GT500 - "That Stuff is Magic"
First of all, I'd like to thank Alchemy-Spetec for asking me to write a guest post on their blog. If you're interested in polyurethane leak seal, I think you'll like this one. I recently did a leak seal job for a homeowner up here in my Candian hometown of Nipawin, Saskatchewan. He had water coming into his basement around a water line access sleeve. It was leaking approximately 1/2 litre of water per minute. He called me to see if I could resolve the issue. I packed some oakum saturated with Spetec PUR GT500 into the sleeve around the water pipe. The leak was stopped in under a minute. I used a moderate quantity of the resin-saturated oakum to ensure the plug was approximately two inches deep. It won't leak again. The customer was extremely happy as this repair means he will no longer have to babysit the water pails all night. He also has the peace of mind of knowing that this is a long lasting fix, so he doesn't have to re-visit the problem each spring or heavy rainfall. When that leak shut down so fast, he look at me and said "that stuff is magic". And now for the best part: click below to watch me shutting down that link in this video clip I took on the job! Want more information on Alchemy-Spetec leak seal products? 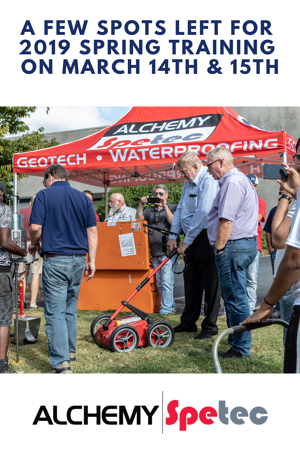 Get ready for a thorough education in Leak Seal, Slab Lifting, Soil Stabilization and the Alchemy-Spetec Deep Lift™ process. You’ll get hands-on training from a technical staff with decades of on-the-job experience. Participants receive a Samsung tablet loaded with training material. Stephen C. Barton (President/CEO), Jim Spiegel (VP Sales & Business Development), Andy Powell (Southeastern Regional Manager), Anthony Sandone (Eastern Regional Manager), and Charlie Lerman (Western Regional Manager). Each instructor is a seasoned professional with at least a decade of experience in the industry. 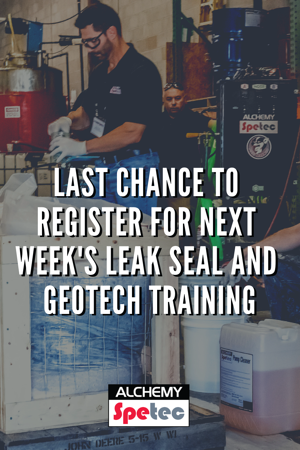 Balance your skill set with Leak Seal AND Geotech training! The best classroom learning in the business! Informative presentations and group discussions packed with practical application instructions, business tips and more. 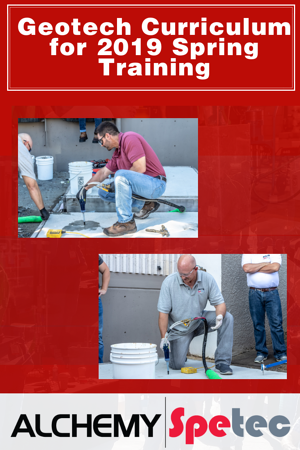 Get a thorough education in Leak Seal, Slab Lifting, Soil Stabilization and the Alchemy-Spetec Deep Lift™ process. You’ll also get hands-on training from a technical staff with decades of on-the-job experience. 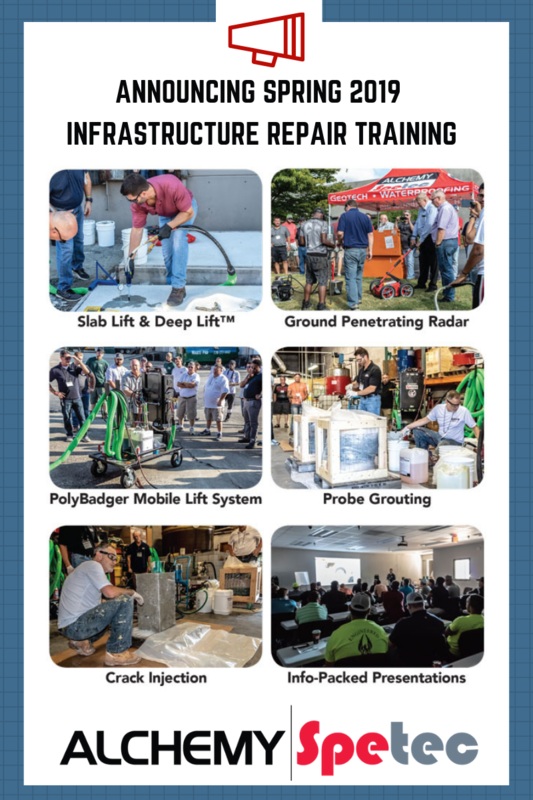 The schedule on Friday, March 15th includes education on the Alchemy-Spetec geotech product line, soil stabilization, slab lifting, the Deep Lift™ process, rig & mobile lifting systems, geotech accessories, soil testing (ground penetrating radar, penetrometer), pricing and estimating. There will also be live geotech demos, product mixing demos, and open discussions for sharing job related tips and solutions from the field. Your instructors have years of experience providing technical support for contractors across the country. 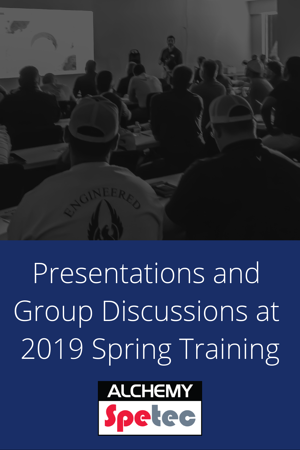 You can look forward to presentations, demos and/or discussions lead by Stephen C. Barton (President/CEO), Jim Spiegel (VP Sales & Business Development), Andy Powell (Southeastern Regional Manager), Anthony Sandone (Eastern Regional Manager), and Charlie Lerman (Western Regional Manager). Participants will receive a Samsung tablet loaded with leak seal training material. The registration deadline is February 28th. 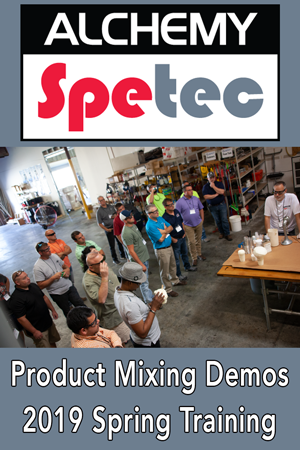 See live product mixing demos! MixMaster Pro – The Production Beast! The MixMaster Pro slab lifting gun was designed based on years of feedback from slab lifting contractors working in the field. Every known point of frustration and difficulty has been addressed in this sturdy, single-purpose gun. Further benefits include a lower cost of consumables (you can reuse ports with this gun), beefy check valves designed to handle the back pressure, and a short 10-minute breakdown/cleaning session at the end of each day. Not to mention the fact that this gun is a production BEAST - no leaky port connections, no fumbling with clamps. Watch your man hours on each project shrink accordingly. Did we mention you’ll have less replacement part orders? There are only a few inexpensive replacement parts on this gun - PERIOD. 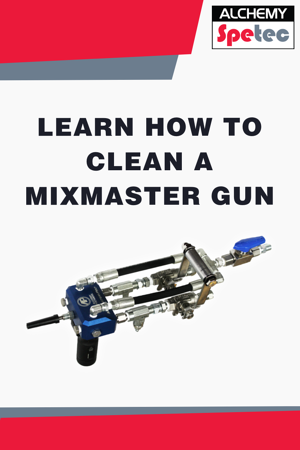 Learn how to do a quick 10-minute breakdown/cleaning session on the MixMaster Pro at World of Concrete 2019! Drop by to see us at Booth # O40551 in the Silver Lots (same location we were in last year). Tour a fully stocked slab lifting rig. 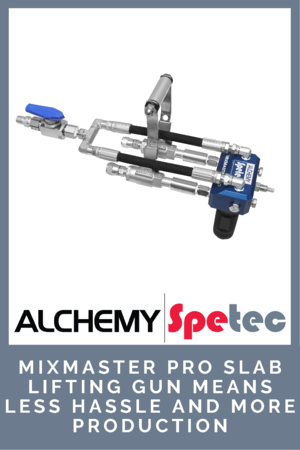 Want more information on the MixMaster Pro? 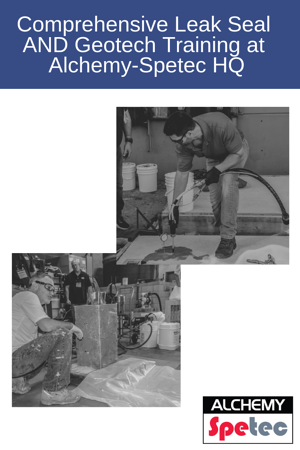 Want to schedule a one-on-one consultation with a rep at World of Concrete?